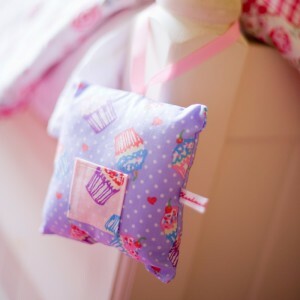 All of the gorgeous fabric accessories, such as washbags, purses and the very popular Toothfairy cushions have been made for me by ‘Handmade by Jane’ – aka Jane Marland. We met at a local Christmas fair a few years ago – our stalls were opposite each other and since the fair was as quiet as a morgue, I had plenty of time to eye up her fabulous fabrics. I bought an Owl drawstring bag (available online today!) and we fell into conversation as I had this idea for a Toothfairy cushion and was looking for someone to make them. I could see immediately that her flair for fabric choice as well as her sewing skills would be a perfect match. We had a high-powered meeting (a lovely lunch in Carluccio with some business chat and a lot of fun chat) to which Jane had bought a Toothfairy prototype. I loved the detail and the thou ght she had put into it; the amount of stuffing to obtain the right sort of ‘squishing’, the quality cross grain ribbon and the contrast pocket. We did have quick debate around the necessary size of the pocket because we knew it had to accommodate the different amounts of money various Toothfairies leave these days – 50p, £1, sometimes even £2! Of course, I commissioned the first batch of cushions and soon moved on to ordering other items. So now we also have drawstring bags, washbags and purses and because one of Jane’s passions is seeking out unusual, fun and often ‘retro’ style fabrics from specialist stores it means that the range is truly ‘limited edition’ as often there will only be enough fabric to make one or two items. She and are talking about expanding the collection over time – so check back to watch our progress or do sign up to the newsletter to receive updates! This entry was posted in About Us, Meet our suppliers, People we like and so might you! and tagged drawstring bags, Handmade by Jane, handmade gifts, purses, Toothfairy cushions, washbags. Bookmark the permalink.